There are certain manufacturing processes that often require the agility of a human worker. Other tasks require the payload capabilities of a robot. Pairing a human worker and a robot counterpart on the factory floor has been a long sought after goal. This goal has traditionally brought about obvious challenges and safety concerns. This however is the case no longer. Fanuc has introduced a collaborative robot safe enough to pair with a human worker without the need for a guarding or safety fences. 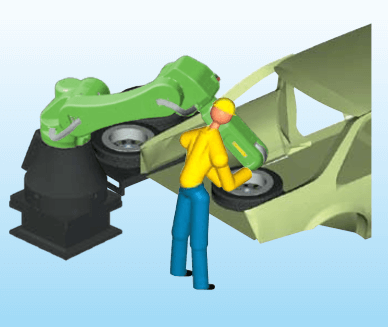 Fanuc’s collaborative CR-35iA robot stops safely when it comes in contact with a human counterpart. It’s certified to meet the international ISO 10218-1 safety standard. The CR-35iA’s exterior cover reduces impact forces and pinch points by providing a soft barrier between the robot arm and the human. 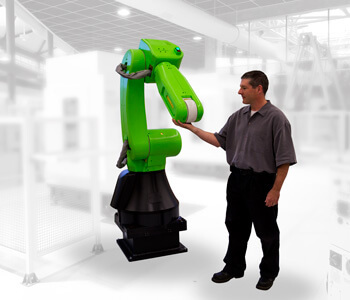 Fanuc’s collaborative robot product line comes in several shapes, sizes, and payload capabilities. The CR-35iA has a 35 kg payload. Click the here and watch the video for more information regarding Fanuc’s excited collaborative product line.